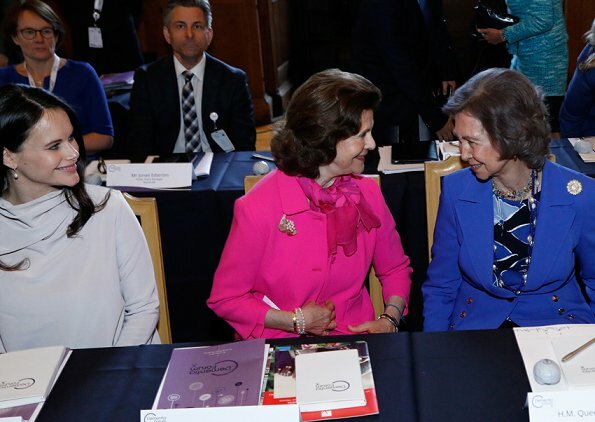 Queen Silvia and Princess Sofia of Sweden and former Queen Sofia of Spain attended second session of Dementia Forum X held at Stockholm Royal Palace on May 18, 2017 in Stockholm. The initiative was organized by Forum For Elderly Care and Swedish Care International in collaboration with Karolinska Institutet, Swedish Dementia Centre, Stiftelsen Silviahemmet and Forte. Sofia looks very pretty in her premaman outfit and with her hair loose. The queens are also dressed very nicely and appropriately. Queen Sofia looks OK, not great not bad. P. Sofia looks bad. Pants And shoes very nice but not the top.her hair looks better. Silvia is The winner for me. She looks great head to toes. Sofia is very pretty and very much loved by her husband. She looks beautiful pregnant with her 2nd baby. Silvia is a bit too old to wear shocking pink. First I had something nice ti say. Did you read the part where I like her pants, shoes and hair ?!! How is that not having nothing good to say?? I complemment her on that! Clearly I had nothing nice to say and I sad it. So cut the act. Secondly I didnt like the top (just the top). So if I dont like one thing, I had a problem with her? I guess I have a problem with all the royal ladies then. You can complemment Sofia on many thing, but if you dont like one thing, its a problem. True. Maybe the 2 Queens called each other before the event: "What will you wear then?" The "new" Princess looks a little bit afraid next to her Mother in Law in trust she will hear no critics afterwards, ha ha. But she looks really nice!! Thanks. Its always bad when you like many thing but you express the fact you dont like one thing. 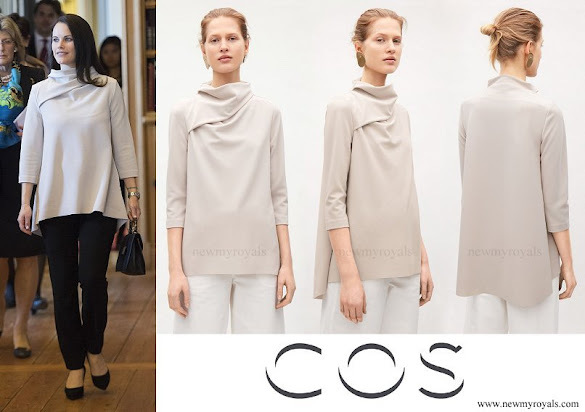 The top is too "fussy", I dont like the neckline. Although the color is nice. P. Sofia looks nice here. Her hairstyle makes her face look softer and younger. And the top is nice - thank goodness not one of those skin-tight things. The queens look nice: conservatively dressed, but nice. Perhaps Sylvia is wearing a bit too much pink? I like especially Princess Sofia´s blouse, it has interesting cut. Silvia looks good and well groomed as always. Queen Sofia looks little meh but better than she looks averidge. I have much respect for her because she really seams eager to learn and she couldn't find a better teacher than Silvia. Sofia has been a member of the SRF for less than two years and already supports several worthy causes. Meanwhile another royal who repeatedly babbled about her attachment to elder people and how much she wants to help them prefers playing celebrity in Cannes. I dont know about Stephanie, but since here we are commenting those other royal women, im not sure that sitting around a table with super expensive clothes and jewels on ,means being involved in charity more than being to a different event.Real charity does not need to appear on pics, so i think its not up to us to judge from this blog who does charity and who doesnt. Well, that's the way royals are doing charities: give publicity, raise money, open doors, awakening attention. Nobody expects them to clean hospital rooms. And of course they wear their usual expensive clothes at such occasion. Looking good and polished is part of the business. 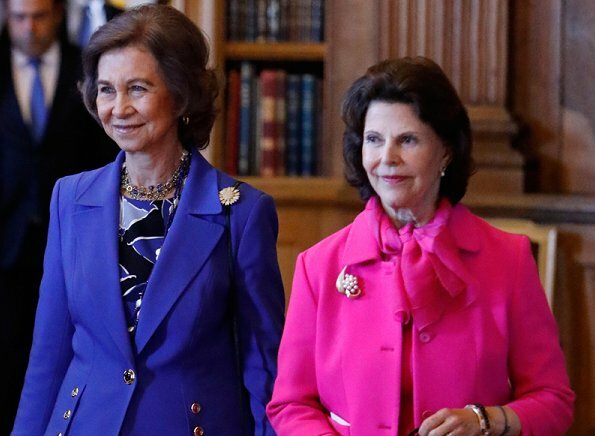 Queen Silvia looks really lovely whenever she wears colors. Pink color looks always beautiful on her. 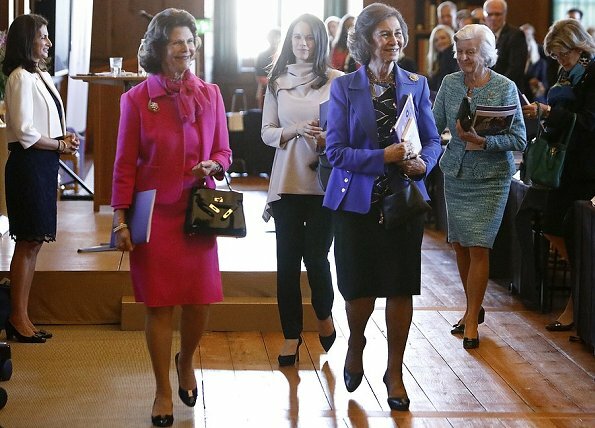 It was nice surprise that Queen Sofia also attended. Liked her outfit as well and the way both queens wore lovely brooches. Princess Sofia wore less color and faded into backround. It was nice to see her give up her usual middle parting. For once her hair were in side part which is so more becoming. Lovely to see both Queens out together at an event. Princess Sofia is certainly glowing during her 2nd pregnancy. Very, very much Swedish lately and not so much news from other royal houses as here used to be!